Prices are shown here. After we have answered all your questions and you know what grants are available, we need to receive an Order Form that will include the necessary information for us to be able to make an invoice for you. Order Forms must be signed, then faxed or emailed as a PDF or photo, or sent by traditional mail. Floor models cannot be purchased with a credit card. We will either send you an invoice or require pre-payment depending on your qualifications. Click here to see our Terms. Click on the applicable link below for a printable PDF form. As noted on the "What's Included" page, Two and Three-Footers come with everything you need to put them into immediate coin-collecting service. Seven-Footers aren't always used for coins, so there are options described on this page. 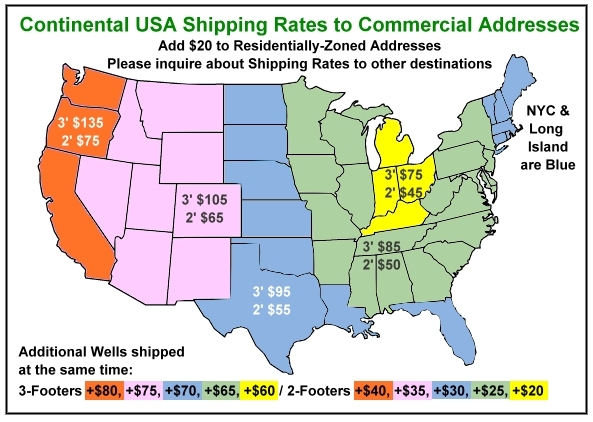 The following map shows the shipping cost for Two and Three-Footers to a commercially-zoned address. This includes churches and schools. If you operate a home-based business, it is considered residentially-zoned if there is a residence on the property. Residentially-zoned addresses are an additional $20 because we have to use a different carrier. INTERNATIONAL, Alaska, and Hawaii: Click here if you are not in the Continental USA. Seven-Footers: We quote shipping for Seven-Footers upon request. We inventory Three-Footers in the most popular colors and can usually ship immediately. Two and Seven-Footers are made after orders are received which usually takes about 2 weeks to build and ship.